Gas condensing boilers: Condensing technology offers optimum energy utilization, resulting in maximum savings for you. A gas-fired condensing boiler is one of the most economical and clean ways to generate heat and can significantly reduce your monthly heating bills, as well as your environmental footprint. Novel Care has over 30 years of experience installing Viessmann gas boilers, as well as many other high-end brands. We choose and recommend brands like Viessmann because we know they’re made well and perform as a customer expects them to. Our Viessmann gas boiler installation services are second to none in Toronto and throughout the GTA and we offer a complete range of Viessmann gas boilers to complement our expert gas boiler installation services. Our Toronto Viessmann gas boilers and expert gas boiler installation services ensure that you’re home will not be without the heat it needs to keep your family warm. 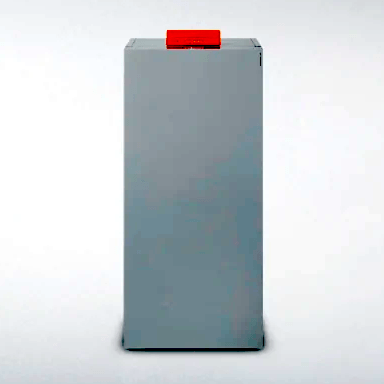 On top of that, Viessmann gas boilers are some of the most efficient gas boilers on the market. As a result of such great efficiency, you’ll actually save a lot each month on your energy bills. 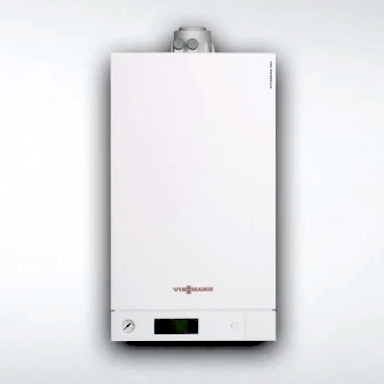 Many Toronto homeowners are switching to Viessmann gas boilers. Learn more about how Viessmann gas boilers can save you money on your next energy bill by calling Novel Care in Toronto today: 416-921-0000. If there are Viessmann gas boilers that you’re interested in that you don’t see below, not to worry. 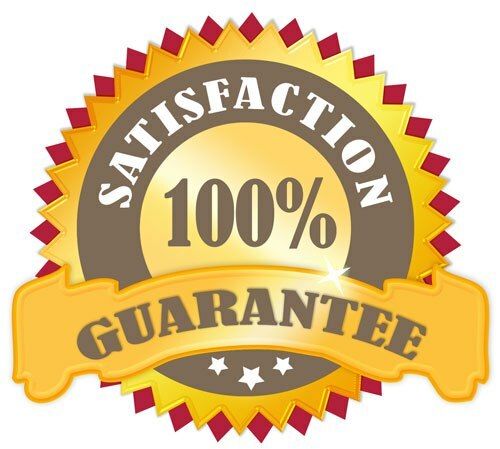 We can source any product you need, just give us a call: 416-921-0000. 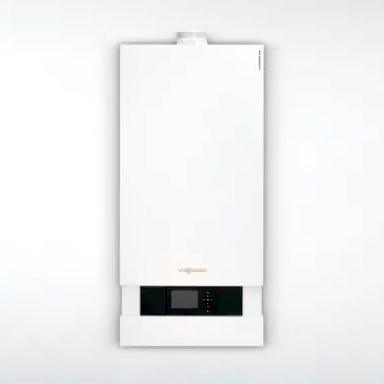 Vitodens 100-W, B1HA space heating boiler, and Vitodens 100-W, B1KA Combi boiler fits any home and budget with high performance at an attractive price. Gas-fired condensing technology and innovative DHW solution in a compact, floor standing design. Efficiency up to 98% at full modulation and 95% AFUE. Exceeds ENERGY STAR® efficiency requirements. Lambda Pro combustion management system. Wide modulation range up to 6.5:1 to precisely match load conditions. Fast heat-up with innovative DHW Storage Tank Loading System comprised of plate heat exchanger, DHW loading pump and storage tank. Compact and hygienic DHW storage with Viessmann-made SA240 316Ti stainless steel tank (26 USG). Ten-minute peak flow of 60 gallons (model B2TB 35/125 only) and continuous DHW draw of 3.3 GPM. Based on a temperature rise of 70 °F (50 °F to 120 °F). Space-saving design with a small footprint and zero side clearance to combustibles. Simplified installation with pre-installed pressure/temperature relief valves, fully enclosed heating expansion tank and circulation pump, and built-in 3-speed DHW/space heating pump with a diverter valve. Multiple venting options with vent length up to 180 ft.
CU3A Series gas-fired condensing boiler with stainless steel Inox-Crossal heat exchanger and MatriX dome gas burner. Rated input: 19 to 199 MBH (single) / 1592 MBH (cascade). 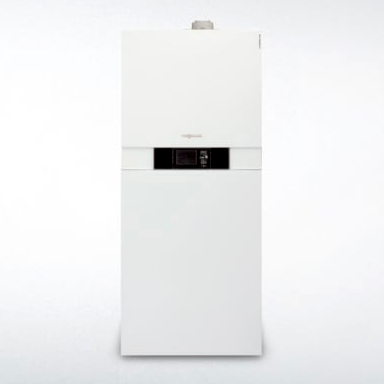 Compact, floor-standing gas condensing boiler from 19-199 MBH. A high efficiency of 95% AFUE on all models. High-temperature operation of up to 90°C (194°F). Vitocrossal Pocket Design with wide water passageways to allow for system/full flow applications. No dedicated boiler pump required and eliminates primary/secondary piping. MatriX dome gas burner with 5:1 turndown ratio to ensure high efficiency and extremely clean combustion. High water volume extends burner run time and reduces cycling. A self-calibrating Lambda Pro combustion management system ensures optimal combustion efficiency at all times regardless of gas/air quality. Simple commissioning with no field adjustments and adjusts to all fuel types (NG and LPG). Durable, reliable, and long service life with Inox-Crossal stainless steel heat exchanger and high mass design. Multiple venting options and configurations with vent lengths up to 198 ft.
Multi-boiler installation with 8 boilers up to 1592 MBH.